A high school friend of mine described a delicious dinner that he prepared to me. I have not yet tried the recipe. However, you'll see why it inspired my own version and why I'll definitely be cooking it when I get near a kitchen again. Instructions: In a small skillet, cook the mushrooms in a little extra virgin olive oil and salt them when they have wilted a bit. (Just a pinch of salt should be enough.) Once the mushrooms are cooked, put them to the side and let them cool. 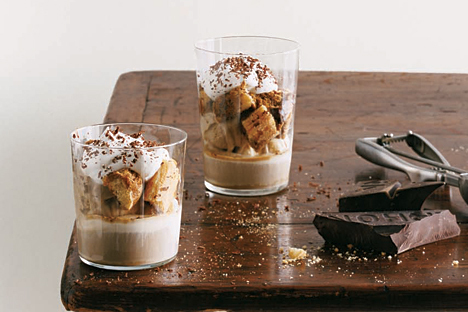 In a large bowl, mix the ricotta cheese, cream cheese, and parmesan cheese. Make sure to stir the ingredients well. Then add the cooled mushrooms to the mixture and fold all the ingredients together, gently. Add salt and pepper to taste. 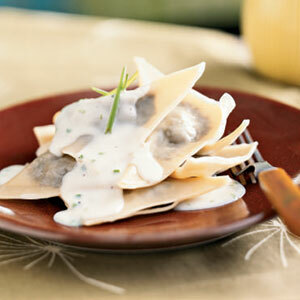 To make the ravioli, take a wonton wrapper and paint all the sides with the beaten egg. Then place 1/4-1/2 tsp of the filling (don't want to add too much filling) on to the center of the wonton wrapper. Take one corner of the wonton wrapper and fold it over to the opposite corner. Then press down gently on the edges to make sure it is sealed. It might take a few raviolis to get the process just right. Also, this would be a great time to get other people into the kitchen to help. (Folding raviolis gets tedious.) After you've finished the filling or the wrappers (whichever comes first), fill a small pot with water and boil it. As soon as the water has boiled, add a tsp of sea salt and slowly add the raviolis. They should only take a few minutes to cook. And they should be done when they float to the surface of the water. (Remember the filling is already cooked so it's just a matter of cooking the wonton wrapper.) Make sure to cook only a few at a time so you don't overcrowd the pot. Once all the raviolis are done cooking, place them in a separate pan with the butter, over medium-high heat. You just want to slightly brown the ravioli to give them some texture. After they are browned, remove them from the pan and add some extra virgin olive oil to the pan. Add the garlic and shallots to the extra virgin olive oil and stir them until they are cooked. Then stir in the cream and add the fresh tarragon. Lower the heat to about medium low and continuously stir the cream mixture. Add the flour and stir. When the sauce has thickened, place the raviolis back into the pan and cook them together for a few seconds. Once everything is heated through, plate the dish and serve. Please try these recipes out and let me know what you think!